Trip Summary:The definitive Himalayan trek, flying into Lukla and climbing to the top of Gokyo Ri with the great views of blue lakes that lies in the Gokyo valley. 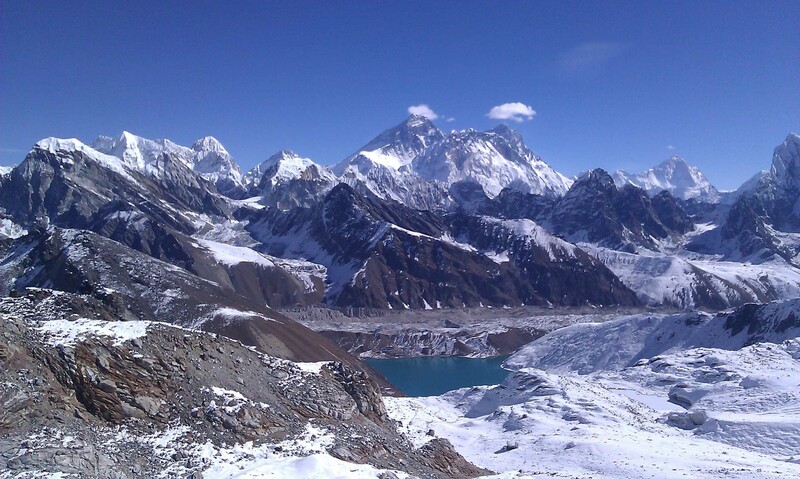 You will have 360 – degree view of the Mountains including Everest from the top of Gokyo RI. 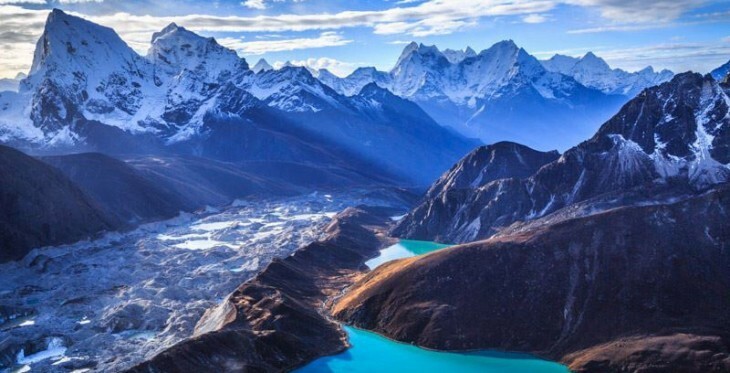 Gokyo Valley Trekking has gained its fame as an alternative trek of Everest base camp due to the breathtaking scenery it offers and the form of adventure. The pioneer trail to Gokyo valley and the outstanding hiking to the Gokyo Ri hold the epic recognition of the trip. The trek offers an opportunity to explore numerous 8000 meter peaks of the Khumbu region and the spectacular Sherpa culture. The wonderful aspects of the trek to Gokyo valley begins from the beginning of the trip. Heading through the picturesque landscape of the Dudh Koshi valley, you can enjoy the alpine flora and fauna of the Sagarmatha National Park. The bio-diversity of the beautiful landscape is further enticed by the Sherpa culture and lifestyles that can be experienced during the journey. The Sherpa culture of the trekking region is highly influenced by the Tibetan Buddhism. Various monasteries, chhortens and mani walls prospect the spiritual lifestyles in the Khumbu region. The upper part of the trek is dominated by the grazing meadows and leaving the tree line, you will be encountered by the Lakes, mainly by the first lake, second lake and the third lake (Gokyo Lake). Hike to Gokyo Ri to witness the Everest, Makalu, Cho Oyu and other 8000 meters peaks. The spectacular icy ridge between Cho Oyu and Ghyachung offer a wonderful view. The scenarios are stunningly incredible that are loaded with snowy peaks, lakes and glaciers. Ngozumba glacier is the longest one in Nepal that has spread along the Khumbu region. Adventure Bound Nepal arranges Gokyo valley trekking with the customized itinerary, experienced Everest guide and the professional team. 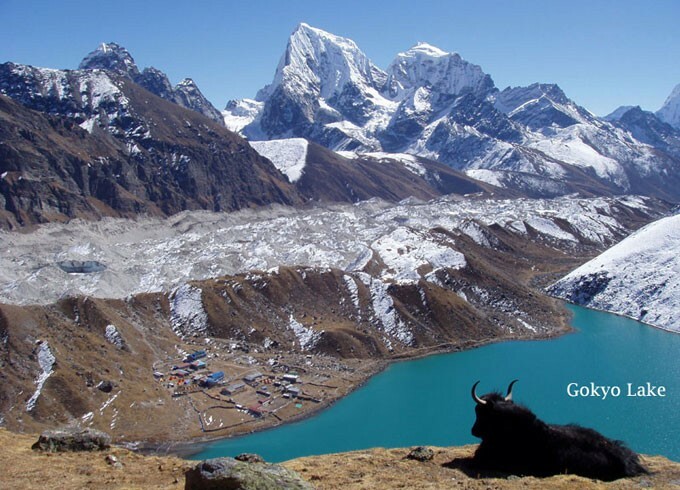 If you want to enjoy the high pass trek with Gokyo valley, Cho La pass from Gokyo is a recommended one. Please, do not hesitate to contact us for the further details. Day 02 :Fly to Lukla, trek to Phakding (2652m). Day 04 :Acclimatization at Namche Bazaar (3446m). Day 02 :Fly to Lukla, trek to Phakding (2652m). From the hotel, drive to the domestic airport and fly to Lukla, which is a 35 minute picturesque flight, enjoying the snowy 8000 meter peaks, including the world's tallest peak, Mt. Everest (8848m). In Lukla, we meet the assisting team and begin to trek passing the stone wall, Nurning and reach to Phakding. Overnight at lodge. Day 03 :Trek to Namche Bazaar (3450m) 5-6 HrsFrom Phakding, as we begin the trek, we can see the view of Kongde Ri. Passing a couple of bridges, we reach to Monjo and enter into the Sagarmatha National Park officially. Then, the trek goes through the steep ascending trail via Larja Dobhan and see the first sight of Mt. Everest in trekking before reaching the Namche Bazaar. Namche Bazaar is the bustling town of the Sherpa people in the Khumbu region. Overnight at lodge. Day 04 :Acclimatization at Namche Bazaar (3446m).Due to the increasing altitude, we need to acclimatize to the alpine weather. Namche Bazaar is one of the best place to take a day break and explore around. You can go for the hiking around Khunde and Khumjung along with the Everest view Hotel. The longest Mani wall in Khumbu, Khumjung Gompa and Khunde Hillary Hospital are the major attractions during your tour around. Overnight at lodge. Day 05 :Trek to Phortse Thenga (3680m) 4-5 HrsAfter the breakfast at Namche, begin to climb up via Tenzing Norgay Memorial Stupa. Then we reach to Kyanhjuma and Sansa. Leaving the main trail to EBC, we take the left and ascend to Mong and ultimately with a steady climb up, we reach to Dole. Overnight at lodge. Day 06 :Trek to Machermo (4,480m) 5-6 HrsAfter the breakfast at Namche, begin to climb up via Tenzing Norgay Memorial Stupa. Then we reach to Kyanhjuma and Sanasa. Leaving the main trail to EBC, we take the left and ascend to Mong and ultimately with a steady climb up, we reach to Dole. After Lunch climb again around 3hrs to reach Machermo Overnight at lodge. Day 07 :Trek to Gokyo Lakes (4,750m) 5-6 HrsFrom Machhermo, the trail is straightforward up and up that passes various Lakes and avalanche trail. We pass the first Lake after Chadoten, then the second Lake at Longpongo and finally reach to the third Lake, which is known as the Gokyo Lake, located in Gokyo valley. Overnight at lodge. Day 08 :Gokyo and Arround (Hiking upto Gokyo Ri (5,357m) (5360m) 4-5 HrsAfter the breakfast, we begin to climb towards the Gokyo Ri, above the Gokyo Lake. This is another spectacular time to enjoy the Himalayan views, glacier and Lakes. The Ngozumba glacier and the Everest 5th Lake along with climbing the Gokyo peak is superb. Then back to the Gokyo valley and rest. Overnight at lodge. Day 09 :Trek to Dole 6-7 HrsFrom Gokyo Lake, the trail is straight down hill to Dole. Descending is fast and easy due to the decreasing altitude. Passing two lakes and Machhermo, we reach to Luza. Continually descending, we pass Kele and reach to Dole. Overnight at lodge. Day 10 :Trek to Namche(3450m) 6-7 HrsDescending via Phortse Thanga after the breakfast at Dole, we reach to the monastery, where Lama Sange Dorje was born. We trek down to Namche via Khumjung, Khunde and Syanboche and finally reach to the bustling Sherpa town. Overnight at lodge. Day 11 :Trek to Lukla (2800m) 6-7 HrsAfter the breakfast, we descend through the downhill trail and wave goodbye to the Sagarmatha National Park. Then we trek down to Manju and to Phakding crossing numerous bridges. It is a gentle walk from Phakding to Lukla passing painted stones and Mani walls. Then celebrate the succession of the trek with crew. Overnight at lodge. Day 12 :Fly to KathmanduFrom Lukla, we fly back to Kathmandu in the morning getting the sights of the Everest Himalayas. From the airport, transfer to the hotel. You have the whole day to do shopping or what is there in your list. Overnight at hotel. Day 13 :Depart to your next destinationAccording to the time of your flight, our airport representative drops you to the International Airport for your final departure. Thank you for joining us for your trekking in Nepal. See you again. It is important to be noted that the Kathmandu -Lukla - Kathmandu flights often gets delayed by hours or even gets cancelled for a day or few days due to unfavorable weather conditions in the mountain airstrip Lukla. Such unfavorable conditions may arise even during the best seasons including months October and November hence inis always better to prepare ahead. In such cases, you must be prepared for long waits either at Kathmandu or Lukla airports, as this can happen either at the start or at the end of the trek and sometime in both cases. We will do our best to avoid such delays, and arrange the earliest next flight for you but it might not always work well as there are many people in que for days long. In case of emergencies and need of urgent flight, the Helicopter rescue can be another option to escape to and from the mountain, except for some bad weather the Helicopters always have easy excess in the mountains. This can be arranged upon your request with some additional cost which sometime is covered by your insurance as well. The Helicopter can be chartered from both the airports, Kathmandu and Lukla with the tentative cost of US$ 3000 per lift which at a time can accommodate maximum of 5 Person. Having said this, we still suggest you to mentally prepare for possible delay/cancellations and arrange some extra contingency days which we can save for the end of the trip and if everything goes normal these days can be utilized for exploring other beautiful destinations around the valley as per your interest and we, the Adventure Bound is always there to provide you different options to utilize the days in best ways.